The property owner was not at the property when the appraiser was there, and the appraiser was frankly stumped as to what this ‘thing’ is. By late afternoon Monday, the appraiser was able to talk with the property owner, and was told about this contraption. Meanwhile, dozens of appraisers wrote back with suggestions or positive “it’s a” statements. One appraiser actually has an administrative assistant who is a HAM radio hobbyist and former HAM radio license instructor, and called me. We had two phone conversations, one before I heard back from the appraiser, and another after. All in all, this has been a fun distraction from all the “you touched me” accusations swirling around these days. Well, believe it or not, this thing reaches out also! I thought I knew what this item is, but was only half-right. I spent about 15 years spread out in the Air Force, college electronics classes and radio broadcasting, and was able to tour a very high power low frequency device that could send coded messages to submarines in the Pacific. So I’ve seen my share of oddities like this. It’s not a clothes line to hang GSE and AMC dirty linen on. It’s not a device to allow horses to run around in a circle getting exercise. It’s probably not monitoring Area 51 activity… although that facility is in the same state as this item. It’s not a capture device when extraterrestrial’s fall to earth. Although it has similar appearance and design, it’s not used by a HAM or Shortwave radio hobbyist. While it is attached to the dirt rather strongly, it’s not part of the property real estate for valuation purposes. It’s doubtful the property owner wears a tin foil hat, or carries a ray gun. Or light sabre. Have you gotten any closer to figuring out what this is? Many of you who wrote back said it’s some kind of antenna. You are correct. After I got that info, I asked the HAM radio hobbyist what this could be. Immediately he said ‘low frequency satellite receiver antenna.’ He could tell the type by the locations of the wires in the array. It might be a transmitter also, but we don’t know for sure about that. 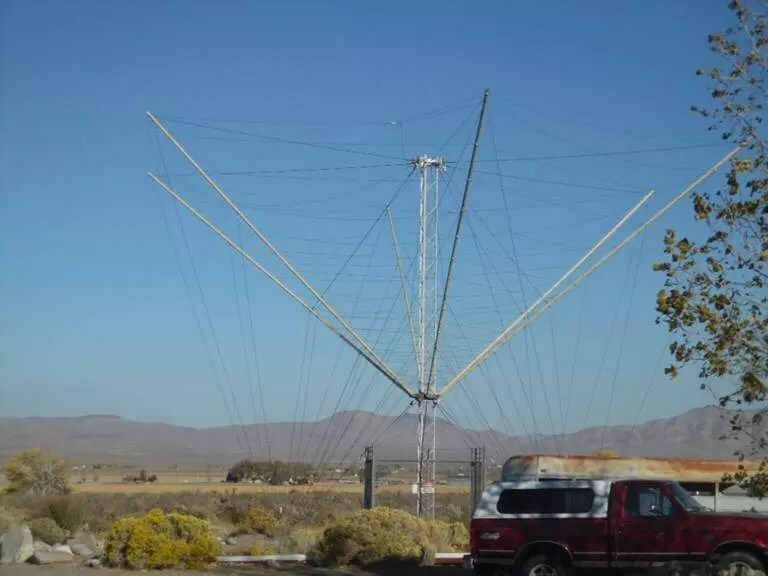 He said the conical design of the array makes it possible to receive (and maybe transmit) signals from a wide cone area hundreds of miles above earth where satellites are either traversing, or in geo-stationary orbit. The satellites are used to monitor lots of activity on earth, and that data has to be delivered back to ground stations and sent to a processing facility. Likely, this is one of many located in other rural areas across the earth. Low frequency transmissions are more reliable than higher frequencies, like are used for satellite TV reception with the small dish antennas. So there you go. We didn’t have to submit a FOIA request to find out the use of this device. And we had fun playing the ‘whatzit’ game! Thank you for sending the email afterwards stating what it was. I was so curious but had no clue as to what exactly it could be. That was a fun exercise. I was convinced there would be an underground bunker with a lifetime supply of dinty moore and spam to go with it. So you can sub lease your land for high tech, think they’d allow that in suburbia? I’m going to do like 10 of them and maximize my potential land income. I’ve got a whole quarter acre here, seeing dollar signs right now. Next story Have AMCs Gone Dark? AMC Have AMCs Gone Dark?